The weather is finally warming up here in Southeastern Michigan, and with it we're starting to see activity in the real estate market pick up. We have seen much of what we have expected so far in 2015, but inventory is still a little low right now, and we have a lot of demand from buyers that are looking for different kinds of homes. 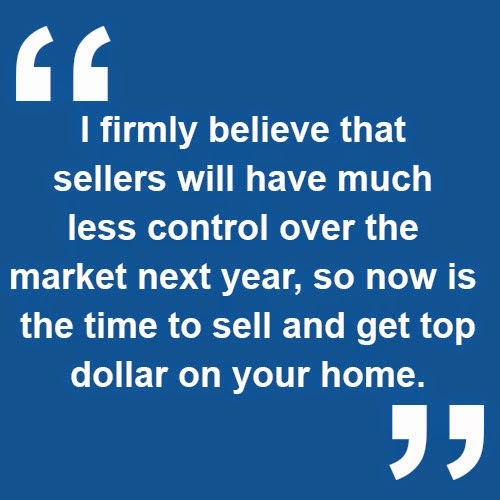 The point is that we need more homes listed in our market right now, and I firmly believe that sellers will have much less control over the market next year, so now is the time to sell and get top dollar on your home if you're serious about it. Please contact me if you are interested in selling this spring. I also want to take a moment to thank all of our valued customers, and to thank HOUR Magazine for naming me a Real Estate All Star for the fourth year in a row. It's tough to be in the top 1% of real estate professionals nationally, but it's important work and I enjoy what I do. None of this would would be possible without all of my wonderful clients. As always, refer to me with any of your Southeastern Michigan real estate needs. I'm always here to help!